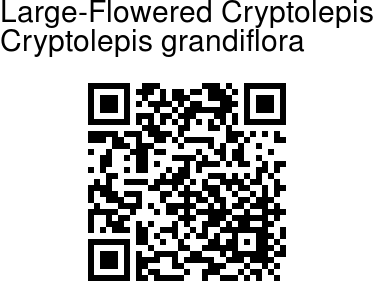 Large-Flowered Cryptolepis is a tall hairless twiner. Leaves are up to 8 x 3.6 cm, elliptic-oblong, base pointed to flat, tip pointed, lateral nerves 8-14 pairs, closely parallel, hairless or slightly velvet-hairy; leaf-stalk up to 1 cm. 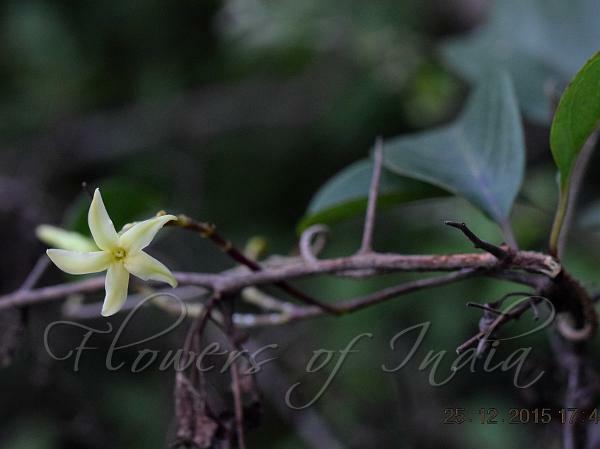 Flowers arise at branch-ends, in 3-5-flowered cymes; flower-cluster-stalk up to 4 cm long. Bracts fal off. Sepals are 5, 1-1.5 x about 0.4 cm, ovate-lanceshaped, margin recurved. Flowers are cream, turning yellow, about 2-3 cm across, funnel-shaped; tube 3-3.5 cm long; lobes 5, broadly obovate, twisted to right in bud. Stamens 5, connivent around stigma. Corona of 5, fleshy scales alternating with flower lobes. Ovary oblong; style to 4 mm; stigma conic. Flowering: November-January.